Welcome to Hammy Reviews! Read my views on various TV shows, films, and the WWE (don’t let the latter put you off!). A list of my favourite TV shows would include Doctor Who, The X Files, Battlestar Galactica (the modern one), and 24. Film-wise, the only genres that don’t do much for me are muscials and rom-coms. A list of my top ten films would include Gladiator, Black Swan, The Fly, Robocop, The Raid, The Empire Strikes Back, Spider-Man (2002), The Terminator, and Dawn of the Planet of the Apes. This is simply a space for my views on films, TV Shows, and WWE. My reviews of the WWE Network’s 100 Best Matches to See Before You Die will be a regular occurrence, until I finally see all 100! I’ll also be reviewing WWE NXT every week and the monthly PPV/Special/Whatever it’s called now. I’m always up for discussion and debate, so feel free to add your comments to reviews. Whether you agree or disagree with me, it’s always good to talk. Or so 02 keep telling me. 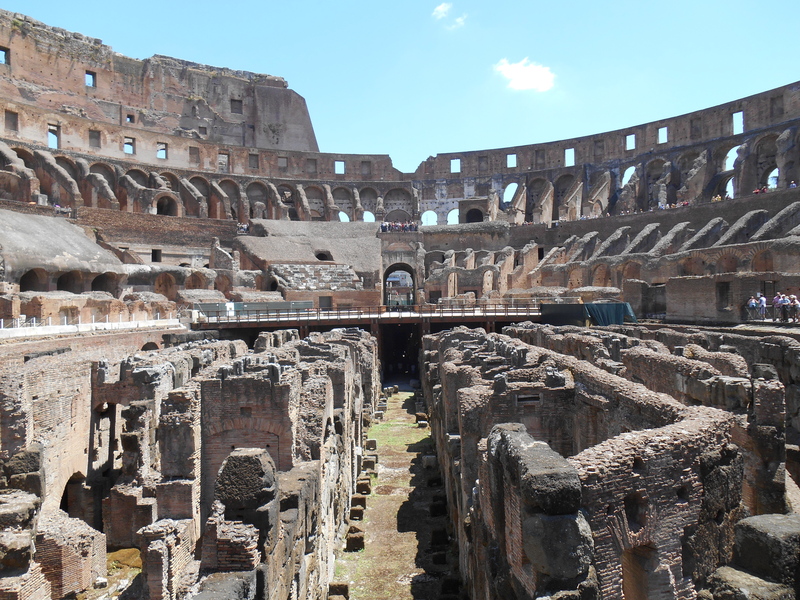 The picture of the arena of the Colosseum is my own, by the way. I visited Rome with my fiancée in 2014 (I want to go back; so much I didn’t see! Like the Pantheon…). The TV screen/cinema screen is the modern Colosseum, where the people gather round to distract themselves from reality. As Promixo said in Gladiator, ‘We mortals are but shadows and dust. Shadows and dust!’ But we become part of something when watching a film, the TV, or reading a book. We are entertained. Reality becomes an abstraction. And if you are not entertained, what is the point? So enjoy my thoughts…or at least be entertained by them! And here’s a sappy blog about hammyreviews Second Birthday… Happy Second Birthday To…My Blog! Great blog, thanks for checking out Geek Blogger UK! No worries! Cheers for the follow! Those are on the ‘to watch’ list! Thank you for following my blog. Your site is really neat. My pleasure, you’ve got really good taste in movies and television. I like to think so!!! What do you mean? I’m always charming. I haven’t done something to annoy you have I? No, I was being sarcastic – because you’re always so encouraging to the authors of the blog sites. lol. I understand. How are you doing? It’s been a while since I last spoke to you. I’m good. You? You can always drop a note on my MISC. discussion board. That’s what it’s there for, to keep in touch. I’m doing well, I’m full of great energy and inspiration. I actually wrote a post on it. Feel free to check my blog out. Looks like V is taking over your blog! Thanks for the follow, and good luck with your reviews. I don’t watch any of the programmes you mention, and I hate wrestling, so I can’t think why you want to follow the blog of a grumpy old guy in Norfolk. But thanks again, anyway. I’m just spreading the great word about blogs Pete. Thank you! I will do the same! Thank you! However, I have just taken a look through your list of favourite director films and realised I still have a lot to learn and watch!!! I’m liking this blog. I also like a lot of the movies you list, and coincidently, “Notes from the Underground,” which I’ve been reading lately. I do like the rom-coms though, at least a few of them. Thank you! Glad you are reading Notes From Underground, a classic. And there’s nothing wrong with a rom com, as long as it surprises me! Hi Hammy, Thank you for following my movie review site. Much appreciated! Glad to have come across your BLOG!! Thanks for following my blog! I’ll check your blog out asap. I’d appreciate if you showed mine some love too! I like the theme you’re going for. Check out my site if you’re interested.